Casino craps, also known as bank craps, refer to an exciting dice game in casinos. In fact, around craps tables, people are usually shouting and yelling out of excitement. 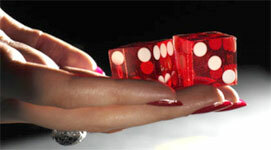 Craps is played at specially made tables with two dice that are made following strict standards. These dice are inspected for damage on a regular basis. As part of its course, they are also replaced with brand new ones every eight hours or so, and there are rules on how players can handle them, as well. To start off, a player, also known as a shooter, has to bet on Don't Pass or Pass. The stickman will then give him five dice for him to choose from and the shooter will choose which ones he wants to roll. The other dice will be given back to the bowl without being used. The shooter can only hold the dice in one hand and throw them with it. These dice need to this the table's end walls. If any of the dice get thrown off from the table, an inspection would be needed prior to playing with them again. Craps tables can hold a maximum of 20 players, each of which get a change at throwing the dice. When a player doesn't want to make a throw, he can choose to bet on another thrower instead. Several kinds of bets exist for craps and the crew of the table consists of two dealers, a stickman and a box man. Each game gets played in different rounds and the dice is rolled by every player clockwise around their table after every round. A player can also choose to skip rolling but can still keep betting. The very first dice roll in a round of betting is called Come Out and every new craps games starts with that roll. The Come Out can only be made after the previous player fails at making a win out of his roll or fails to hit the Seven-Out or Point (by rolling a seven). Each new game will then start with a different shooter. Whenever the player does make a Point, he will get the dice back so he can start a new roll. This would count as a roll continuation for that player even though a Come Out technically identifies that a brand new game is about to start. If the player fails to get the Point, a new player will get the dice to make a new roll. The game will then keep going like this. The next player will always be the one on the left, so the whole game actually moves clockwise around the table.